As your business grows, you will need to determine when and how to spend money on supplies, new equipment, new team members, and so on. You don’t want to start throwing your money around without first assessing a need, determining whether you have the money to spend, and projecting what the benefits of spending that money will be. A cost-benefit analysis can help you determine where to efficiently spend your money for the best potential returns on your investment. Determine if an investment is sound—verify that the benefits outweigh the costs and, if so, by how much. Compare the total expected costs against the total expected benefits. Estimate the amount of time it will take to realize the benefits of your investment. For example, say you are developing new software and your current development team is stretched to the limit. You can do a cost-benefit analysis to determine what benefits you’d gain from introducing new software to the market, how many people to hire, and how much money will be needed to pay the new hires and to estimate if the return on this investment will outweigh the costs. A cost-benefit analysis, sometimes called a cost savings analysis, is critical to helping you determine whether to go forward with a new project or proposal. Follow these six steps to help you perform a successful cost-based analysis. This step helps you understand the potential costs of doing nothing and can help you determine whether it is even feasible to start a new project. Sometimes doing nothing is the right thing to do. On the other hand, doing nothing can lead to disaster if you fall behind your competitors—doing nothing could end up costing you more than making an investment. Consider using a mind map to brainstorm the potential costs of each project and link them back to expected benefits. What additional revenue will come in from the investment? What is the return on investment? Define what the ROI means to your company—maybe you measure ROI by revenue, efficiency, or market share. However you define it, list the benefits associated with ROI. Determine how far into the future you should look to identify long-term benefits. If you look too far, the less confident you can be about potential benefits. For example, if you expect long-term benefits from a new computer system, rapidly changing technology could mess up your plans. All costs and benefits need to be measured in the same monetary unit. If you are doing a cost-benefit analysis for a global company, don’t try to separate the costs of a project into different denominations based on country or region. It is much easier to track the actual costs and returns if you assign the same currency to everything. How many people will be needed to complete the project? Will you need to hire new people? How much new equipment will be needed? Does existing equipment need to be replaced? Will training be involved? How much time will be lost to training? Monetizing the benefits may not be as easy as putting a value on the costs because predicting accurate revenues can be tricky. Consult with other stakeholders to determine the value you will assign to intangible benefits, such as maintaining employee satisfaction, ensuring employees’ health and safety, or strengthening your company’s position with distributors. Map out when you expect the costs and benefits to occur and how much they will be. 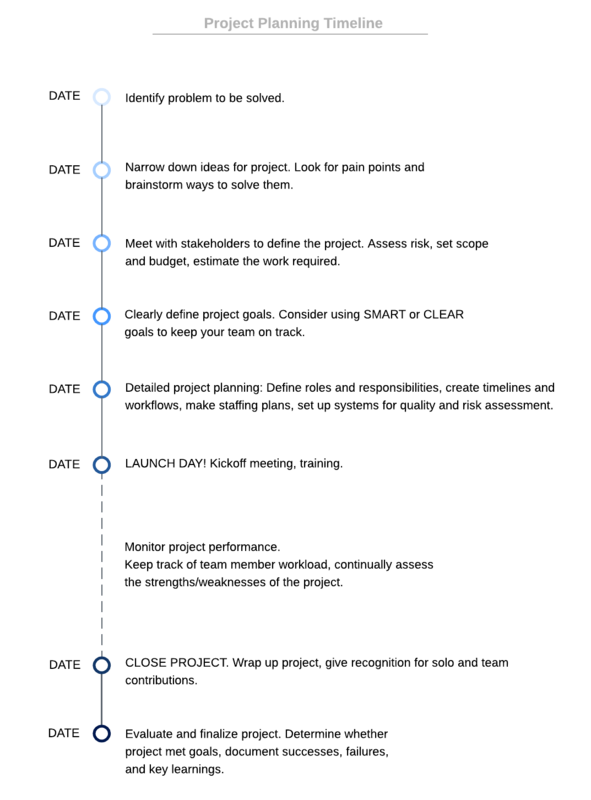 The timeline helps you align, define, and track the expectations of all interested parties. In addition, the timeline can help you plan for upcoming costs and revenue impacts, which will let you manage and adjust as necessary as things change. Calculate your total costs and your total benefits based on the lists you’ve made. Be sure to use the same currency for all of your calculations. Comparing the two values lets you determine whether the benefits outweigh the costs. The purchasing power of a dollar will be less in one year than it is today. For example, if the rate of inflation is three percent, in one year, one dollar will only be worth 97 cents. In 12 months, you’ll pay one dollar to buy an item that costs 97 cents today. In spending money now to fund your project, you will lose potential income from interest if you were to invest the money instead. This rate represents the future value of today’s currency considering the effects of inflation and the lost return on investment. The payback period defines how long it will take to reach your breakeven point when the benefits have repaid the costs. To calculate the payback time, divide the projected total cost by the projected total revenues. 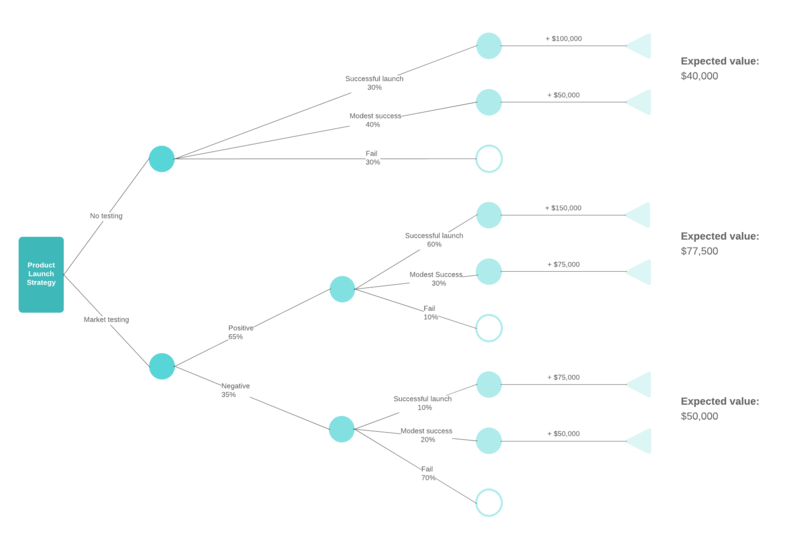 If you’re comparing the costs and benefits of different business decisions, you can create a decision tree to map out different scenarios, weigh the projected outcomes, and present your findings to stakeholders and decision-makers in a way that’s simple to understand. Whether you are planning large or small projects, chances are that you are not conducting a cost-benefit analysis on your own. There may be many people within your organization who need or want to be involved in the analysis process. Because many companies have many geographical locations spread across the world, it can be impossible to get everybody in the same room at the same time. Lucidchart can help you bring everybody together at the same time regardless of physical location. All documents are stored in and can be accessed from the cloud, meaning that all participants can work on the same document at the same time from any location in the world. Because all your Lucidchart documents are stored in the cloud, they can be accessed and updated in real time as new ideas are thought of and decisions are made. Sign up for a free Lucidchart account and get started today.